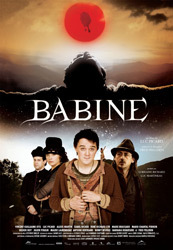 This is the story of a man called Babine and the people of his village. We meet Toussaint Brodeur the Fly-tamer who is a blacksmith in love with a widow from St. Barnabé who cheats on him with the old-fashioned priest; Méo is a hairdresser whose love for the bottle results in his customers having strange hairdos; Madame Gélinas, who has been pregnant for the last two decades and who can’t seem to make her cakes rise anymore; the beautiful “belle Lurette” who has been crying her eyes out and peeling petals off daisies ever since her true love went to War; and, last but not least, Babine, the Witch`s son who is at odds with the strict new priest. All of this comes from the fertile mind of Fred Pellerin, who also narrates the film. Pellerin usually makes a living standing on a stage somewhere in Québec and more recently France telling wonderful, magical stories set in the village of St. Élie de Caxton. Babine is set at some unspecified time in the past, when oxes could fall in love and where a clock could grow from pocket watch that`s been tossed aside.